geniaBeana Scraps: Speed Scrap tonight! Come join in on the birthday fun at GDS tonight. I'm hosting a speed scrap and we're going to have a blast. If you play along you can get this Hoo's My Boy Add-On. It starts at 9:30 EST. 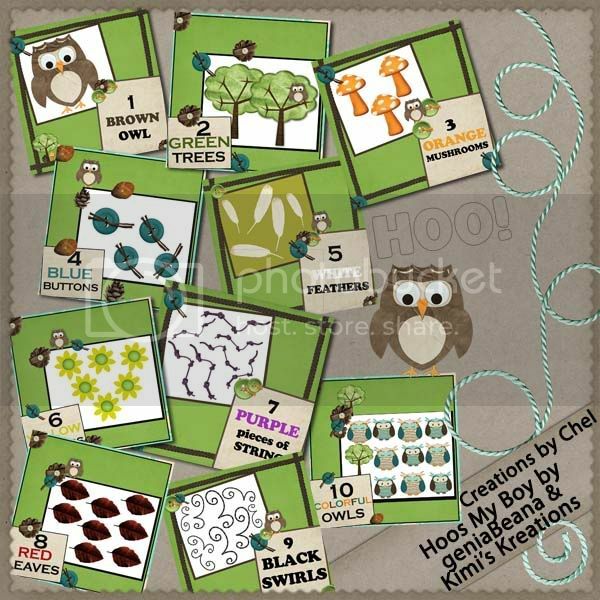 Chel, one of our awesome KgB girls made these adorable counting cards with Hoo's My Boy. If you want to try out a hybrid project, these are perfect for printing out and making a little something for your little someone. She used some great templates from Geeky Diva Designs. See you at the speed scrap! Thank you so much! These are just adorable! Thank you so much for this Freebie. I want to let you know that I posted a link to your blog in Creative Busy Hands Scrapbook Freebies Search List, under the Page 5 post on Sep. 06, 2009. Thanks again.